The National Weather Service (part of the National Oceanic and Atmospheric Administration, part of the Department of Commerce) has been broadcasting weather updates like my ICE STORM WARNING for a few hundred years or so. 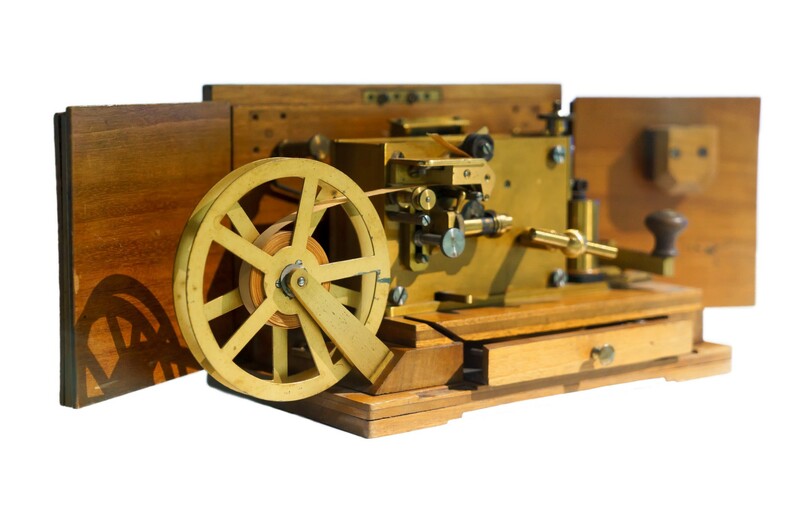 To get messages around the world over the years, they’ve adapted to telegraph, telephone, teletype, multiple computer networks, text formats and encodings, trying to stay broadly useful but up-to-date. In one of these updates last April, the Service put out the word: no more all-caps updates! Mixed case sentences from now on! No more shouty robot warnings! This initial roll-out of the mixed case text format will be followed later in 2016 (tentatively July — August 2016) by NWS short duration Watch, Warning, and Advisory products. Most other NWS text products will be issued using mixed case by January 2017. Future Service Change Notices (SCNs) to announce these transitions will be issued with at least 30 days lead time. EFFECTIVE AUGUST 16 2010 NWS WILL BEGIN PROVIDING ALL NOTICES SUCH AS THIS ONE IN UPPER AND LOWERCASE ALPHABETIC CHARACTERS RATHER THAN ALL UPPERCASE AS IS PRESENTLY DONE. But why were they that way in the first place? And why do half the sites and apps you check still show shouty caps? 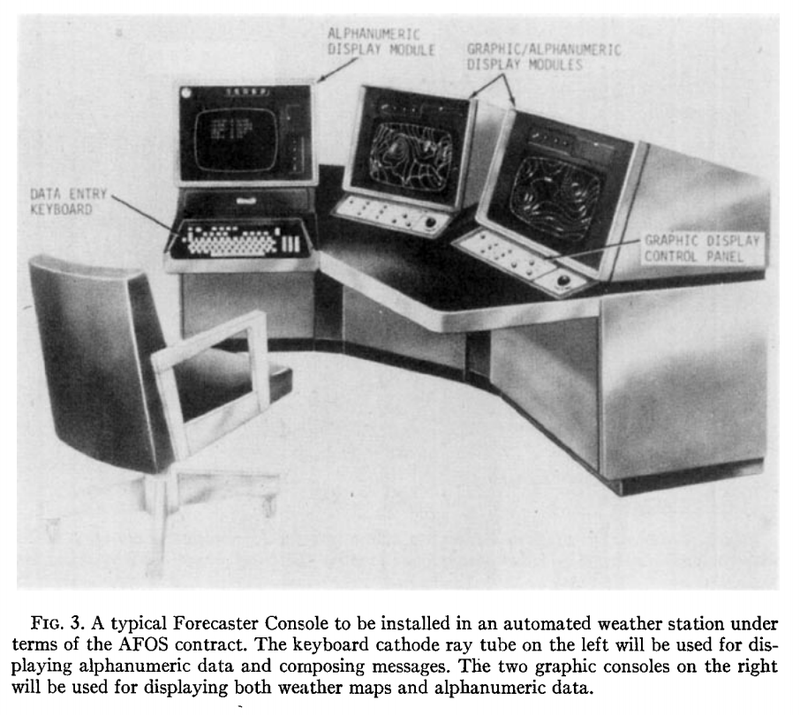 The shouty-caps updates were until recently zipped around the globe from NWS’s Advanced Weather Interactive Processing System (AWIPS), a beast of a network designed by PRC, Inc. and installed in the late 90s, which replaced AFOS (please read that gorgeous goddamned PDF), a network installed in the 80s. In the last ten years, Raytheon has migrated the NWS to AWIPS 2, which is as momentous an upgrade as that version number bump would lead you to believe. Heck, the documentation’s all online. Now, the funny thing about the timing of the various computer revolutions is that they overlap enough that a few well-kept networks from the early days are still alive and kicking, so you can guarantee that every time you lop off some backward compatibility, a sysop in a basement office somewhere will groan, outraged. Upgrades for important alerts like ICE STORM WARNING have to roll out slowwwwllly and methodically. The NWS used all-caps in their telegraph updates in the 1850s because THAT’S HOW TELEGRAPHS ROLL STOP, which overlapped with the teletype upgrade in the 1920s, and the teletype systems overlapped the first computer network installations… Hence the seven years since “okay, we decided to do mixed case!” You really have to check things out with everybody. So, now that’s settled, and everything’s mixed-case, right? Most of the updates you see if you’re not a sailor are in the next stages of rollouts, set for February and April. Graaaa — duuu — al rollout. Next month, click through your weather apps and local news sites. How many of them are still showing converted updates in shouty caps? Some updates will still be sent all-caps to convey urgency (though I’d argue readability’s more important in those cases), but most only show up uppercase in your browser or on your phone. It turns out that when you share your data freely, there are tiers of users: the other global weather-tracking folks, who are going to have similar ginormous networks with well-documented standards, and who you’ll test with from day one; other systems and software that receive your updates that will do your own testing; but now! There are web sites, apps, feeds, and all kinds of odd little ad hoc services that consume your API quietly, and present your alerts in their own designs. When your service has been putting out all-caps alerts for 160something years, you can bet a designer is going to mock up their weather updates app with text-transform: uppercase applied in the stylesheet. Or maybe the weather site’s backend API pipes every alert text through strtoupper(). It was a reasonable assumption to make five years ago, if you were a contracted web developer on a deadline who wasn’t subscribed to the NWS list! This is why standards nerds argue so passionately. They’ve seen how long it takes to steer technology away from its roots, no matter what zippy startup culture can get away with on the surface. Choices we agree on now are going to stick around, and get baked into the foundational brick of our biggest, most critical systems. Be careful what you toss in there! Be careful what you assume! YOU MAY BE SHOUTING FOR NO REASONNNNNNNN.